"What would you do if something happened to Greenspan?" a reporter drilled John McCain during the primaries. 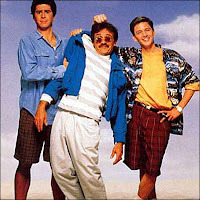 "Well," said the Senator, "I'd put sunglasses on him and prop him up like that guy in Weekend at Bernie's." McCain is now throwing under the bus anyone and anything that will help his cause. It calls out for a Photoshop!